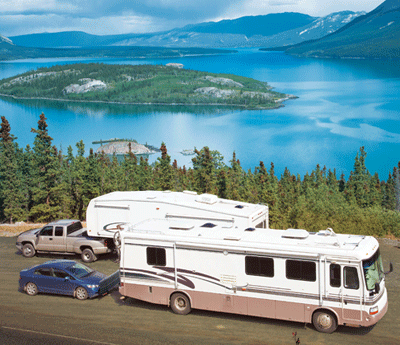 For motorhome owners who tow a vehicle, supplemental brake systems are an important consideration to maintain safety when traveling the open road. Roadmaster, a world leader in towing products since 1974, introduced InvisiBrake to the marketplace a few years ago with great success. Known as a "hidden" system, InvisiBrake offers motorhome drivers convenience with a fully-automatic supplemental braking system that works in tandem with the motorhome. Since most vehicles have vacuum assisted power brakes, Roadmaster has incorporated Smart Products' Series 300 Modular Check Valves to be installed within InvisiBrake's vacuum line. 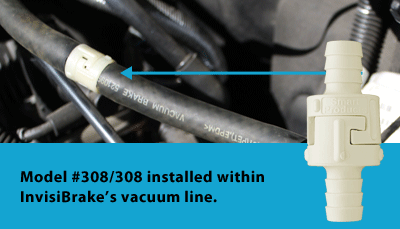 Once installed, the valve isolates the engine and creates a vacuum to help activate the vehicle's power brake system. The InvisiBrake system offers a 3/8" barbed size in Model #306/306 or a 1/2" barbed size in Model #308/308. Per Roadmaster's website, motorhome brakes aren’t built to stop an additional 3,000 or 4,000 (or 10,000) pounds of towed weight. They’re built to stop the weight of the coach and its contents. Safety is the number one reason most people add a supplemental braking system. Additionally, most states and provinces require the use of supplemental brakes by law. And, as an added bonus, supplemental brakes cut down on wear and tear of the tow bar, bracket, and frame of the towed vehicle, as well as enhance the lifespan of the motorhome's brakes. 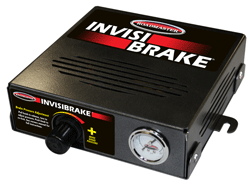 For more information about Roadmaster's InvisiBrake, click here.